A Muslim religious leader who helped spearhead a push to get the National September 11 Memorial Museum to censor references to Islam in a short film about al-Qaida has said Jews "killed the Prophets and Messengers" and are a "cancer ... in every generation as they get in power." Mustafa Elazabawy, imam at Masjid Manhattan, made the remarks in a December 2008 khutbah, or sermon, called "Children of Israel." A recording of the sermon remains on the mosque's website. Elazabawy wrote a letter to museum leadership last month, complaining that the 6-minute film about al-Qaida's rise "would greatly offend our local Muslim believers as well as any foreign Muslim visitor to the museum," if it is not changed. "Unsophisticated visitors who do not understand the difference between Al Qaeda and Muslims may come away with a prejudiced view of Islam, leading to antagonism and even confrontation toward Muslim believers near the site." He also joined in a follow-up complaint sent to museum Director Alice Greenwald on behalf of New York Disaster Interfaith Services' advisory group. Critics have taken issue with the film's references to "jihad" and the hijackers' Islamist ideology. "If generalized labels are needed, we suggest using specific terms such as "Al Qaeda-inspired terrorism," the letter from the Interfaith Services group said. Similar complaints were issued by Islamist groups such as the Council on American-Islamic Relations (CAIR) and the Muslim Public Affairs Council (MPAC). The museum is scheduled to open in two weeks. Thus far, officials have indicated they do not plan to make changes to the film. Elazabawy's demands for interfaith sensitivity were absent during the 2008 sermon, which came during Israel's Operation Cast Lead incursion into Gaza aimed at curbing Hamas rocket-fire toward civilian communities in Israel. He emphasized a series of Quranic verses depicting Jews as mischievous and corrupt. "And after the mischievement (sic), they will seem arrogant," Elazabawy explained after reading one verse. "'We are the powerful. We are the most powerful people. We could defeat whomever we need.' Arrogance actually came from the shaytan [devil] all the time." Later, he seemed to blame Jews for the war in Afghanistan. "What they did, if you remember my brothers, the war in Afghanistan, behind that, the war is exactly the state of violence. They went in that land after Allah give the victory for the people of Afghanistan against Russia, they came because they don't want anybody to have power, except them ... and they bring all their allies to Iraq to finish Iraq, return Iraq, 100 years back. Why? Because Iraq used to be number four in power. They don't want anybody in power. And they use the hypocrites of the Muslims to help them, and the Muslim follow them, because they control the money, they control the weapons, they do everything." Jews were spreading mischief in Egypt, Sudan and Somalia, he said. "They are cancer in everywhere, in every generation as they get in power. People turn their face, and they know they are tyrants, they know they are oppressors. They know that they kill the children of Muslim[s] all the time. But everybody permits it because they controlling the money and the position in the whole entire world." At another point, Elazabawy said it wasn't Jews that he opposed, but "the state of violence ... that will kill even the Yahud [Jew]." The rare Jews Elazabawy embraces are radical orthodox Jews who see Zionism, the belief in a Jewish homeland, as sacrilegious. Two months after delivering this sermon, Elazabawy joined Rabbi Yisroel Dovid Weiss at a City College panel discussion in New York. 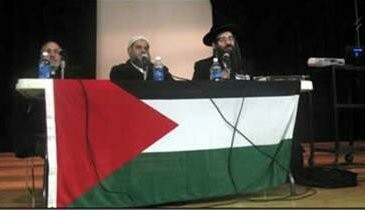 Weiss leads Neturei Karta, which opposes Israel's existence. Zionism, Weiss said that night, "is rooted in blasphemy, in, in a rebellion against God. But the whole concept of having a piece of land happens to be, in the teachings of the Torah, forbidden." "It was mentioned that the Jews, Muslim people… these are people, we have been living together truly for hundreds and hundreds of years," Weiss said. "This was prior to any human rights, before there was a United Nations, before any human rights were there to protect, there was no protection – except of course, God the Almighty. And we were able to coexist, live in harmony, in every single Muslim country, in every single Arab country, we were able to coexist, and there was, without any police protection." Elazabawy does not object. So even though Elazabawy has said Jews are a "cancer" in every generation and have "killed the Prophets and the Messengers," Weiss and Elazabawy manage to bond over their shared antipathy toward the Jewish state. In his khutbah two months earlier, however, Elazabawy said Jews rejected the prophet "because he came from the Arab and he did not come from them, what they said? They declare a war from the first day and hatred against Islam." And in a world in which baseless anti-Semitic conspiracy theories like the Protocols of the Elders of Zion continue to circulate, Elazabawy told worshipers a story so grotesque it cannot be found on Internet trash sites. "They kill our children. It's halal [kosher] for them. It is a hero. It is a victory ... Begin and Sharon in 1967, they used to bring the Palestinian women, pregnant Palestinian women. They used to bet between both of them is it son or girl, boy or girl, between Sharon and Begin. And then after all what they did, they killed with a knife, and they opened the belly of the woman to find out if there is a boy or there is a girl. If they found it's a boy, they killed the boy and they leave it exactly the same what Pharaoh did with them before. It is a disgusting canard. Had it any legitimacy, it would be widely reported and invoked incessantly. But Elazabawy wasn't interested in facts that day. And this is the faith leader who is admonishing the National September 11 Memorial Museum about language in a film about al-Qaida that is accurate. Free Speech or yelling "FIRE" ? Aren't this Muslim leader's comments tantamount to yelling "FIRE" in an auditorium - inciting hatred, and potential violence? One would hope at some point that the direct, relevant connection between Islam, violent Jihad and Jew hatred will eventually be revealed. Telling these people "NO" in no uncertain terms would be a hurricane of fresh air and a huge step in that direction. Of course if Obama proves true to form he may publicly intercede on this butcher's behalf.